Compliance Suite (CSNE) erases sensitive data from computer hard drives so that it may not be accessed via software or hardware recovery. CSNE is tested extensively with Guidance Software’s Encase® forensic tools, the industry standard. CSNE offers a centrally managed, task-based solution by installing server-based configurable agents on client machines. Logging support and confirmation are included as part of the reporting process. CSNE provides a solution that is policy driven, passive, automatic, transparent and fully auditable, providing detailed log file reports. CSNE allows the Administrator to set tasks, such as the wiping of free space (this ensures that data deleted via the standard keyboard Delete key is non-recoverable) when the client is idle, set document retention policies, empty the Recycle Bin, remove traces on online activity, clear “locked files” such as the paging or swap file, and erase data based upon location, age, creation date, filter or event. Compliance Suite allows you to erase and destroy data with methods that exceed the US Department of Defense standards for secure file erasure (DoD 5220.22). Business users will appreciate new functionality to incorporate data retention within their erasure tasks. This provides the ability to destroy files and folders based upon age, date, location, event and other criteria. You will now be able to implement document life-cycle policies that are automated, passive, transparent and fully auditable. You will find CSNE to be an essential component of your HIPAA, Sarbanes-Oxley, FACTA and GLB toolkit. The Scheduler is responsible for defining and executing tasks. After tasks have been defined, the Scheduler panel displays the computers’ names the task is running on, the schedule, the time it will run next as well as the time it had last been running and the current status (pending or running). The Scheduler allows for better management of system resources while keeping your network computers secure. You may, for example, run CSNE when a computer is not in use, or when it has been idle for a number of minutes. You may, of course, run tasks upon demand. Compliance Suite provides extensive, comprehensive log file reports of each data wiping operation. These reports detail erasure activity per client, and may be easily parsed into your corporate database to generate customized reports. 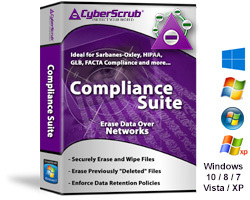 Designed for security and protection, CSNE clears Windows streams and memory dumps, RegEdit traces and other areas that retain sensitive information. Dun & Bradstreet OpenRating™ has awarded CyberScrub LLC a score of “94” out of a possible 100 for outstanding Customer Service. We value your business and will work hard to ensure the best user experience.